Waking up the day after the Torres Mirador hike was a new lesson in leg soreness. Our rental apartment’s bedroom was on the second floor, and I made sure I only had to go down the stairs once. I don’t even want to think about the multiple minutes it took to get to the first floor. My knees seemed as though they were discovering their ability to bend for the first time. Clearly, they were not excited by that prospect. Once again, we made sure we had our our layers, snacks, and the makings of lunch sandwiches, and were out the door before 7 a.m. The bus ride was gorgeous again, watching the sun rise over nearby mountains, the driver honking to shoo herds of guanacos off the roadway. At Laguna Amarga, we showed our stamped tickets from the day before and headed back to the bus. This time we were headed to the last stop at Pudeto, about another half an hour beyond the entrance. After a short wait, we were joined by many of the other passengers, most of whom were heading to the ferry and longer hikes. Our bus arrived at Pudeto just after 10, and we breakfasted at one of the picnic tables behind the cafeteria. Once again, the sun was warm and we had over-layered in anticipation of bad weather. A couple we had seen the previous day joined us as we were finishing and were impressed we had done the entire Torres hike in a day with two bus rides thrown in. They were smart enough to have at least one knee brace, however. We settled for ibuprofen. The Cuernos Mirador trailhead begins a few hundred feet up the road from Pudeto, which is thankfully a smooth slope. We picked this trail to do after the Torres Mirador because it was much shorter and much flatter. We also wouldn’t have to rush to make it back for the 6:30 bus pickup so we’d be able to spend more time enjoying the vistas. This trail begins as a flat walk to the Salto Grande waterfall. The falls crash into a small, dark-walled canyon with smaller torrents above and below. Like many places around Torres del Paine, the canyon walls reveal a small section of the rock layers that help form the park’s geology. These layers are made up of stone of various hardnesses, so they often wear unevenly. In some spots, this means that fins of rock arc up from their surroundings and create formation that almost look like manmade fences. Just beyond the waterfall is a viewpoint of the Condor and Cuernos mountains where many day-tours stop. But the trail continues and so did we. By now, our legs had warmed up to the idea of some more walking and hurt less. The next section of the path took us gently around and through areas of forest that had been burned over in human-started forest fires. While many of the trees in this area are still standing, their bare branches eerily reach toward the sky as if in supplication. This area perfectly illustrates the reason the park is so strict about camp fires and stoves – the wind can pick up in seconds and the flames can be out of control in moments. As far as I know, all the recent fires have been caused by tourists. Fines have been increased and enforcement is strict. Down past a lake and up over the final ridge, and we were at the Mirador. There were a handful of people snacking on the rocks, but this trail sees much less use than the Torres does. We settled in and ate our lunch, chatted, took pictures, soaked in the views. Echoing across the lake, occasional glacial crashes could be heard. We saw one small section collapse and side down a rock face – what must have been hundreds of feet but looked small across the distance. Patience paid off and eventually we were the only ones at the look out. Without other voices and low wind, we could hear the ice and rocks grinding almost continuously. We could watch wind push sparkly waves across the lake at our feet. It was absolutely enchanting. Every direction you can look from this point is beautiful. Again, the wind picked up suddenly in the afternoon, this time about 3 p.m. Signs at the beginning of the trail warn that gusts can reach dangerous levels quickly and so we donned our jackets and started back. As we walked, the breeze only got stronger, confirming our decision. By the time we reached the waterfall viewpoints, there were moments where it was difficult for me to walk when the gusts swept in just right. Not quite Iceland bad, since we could still breathe facing into the wind, but gaining strength. The spray from the falls was now reaching up and over the viewpoint and it seemed wisest to head back to the cafeteria. We spent the last couple of hours before our bus arrived sipping beer and warm coffee in the cozy cafeteria building and watching clouds being pushed over the distant mountains. After an hour or so, the ferry arrived and we were joined by dozens of others. While we didn’t get to see the iconic glaciers or trek the ‘W’ or ‘O,’ we at least got a decent taste of Torres del Paine. It really is one of the most spectacular places in the world. The two days partially filled our hiking meter, but left us craving hikes in the Pacific Northwest. We’ll have a lot of trail miles to make up for when we return, though I am so happy to have seen and hiked in one of Chile’s most iconic landscapes. In case anyone wants to day hike from Puerto Natales, there are several bus companies that make daily trips to Torres del Paine. We used Bus Sur because they let us buy tickets in advance online (though if you buy in person at the terminal, you can get a discount on round-trip tickets). Other companies like Juan Ojeda, Maria Jose, and Bus Gomez also make the trip. As a general rule, buses leave Rodoviario Terminal in Puerto Natales between 7 and 8 a.m. in the morning and arrive at various points in the park between 9 and 11. For day hikers, the returning evening buses leave between 6:30 and 7:45 p.m. and arrive in Puerto Natales between 9 and 10 at night. It makes for a very long day, but there are several hikes that can be done in that time. If we opted to do the Torres hike again, I’d go on the same 7 a.m. Bus Sur trip since it is the first one to arrive and that saves time waiting in line during the registration process. But I’d consider taking a later return on a different line in order to have more time at the Mirador. After all, it is a shame to hike all that way and turn right around again. And that also gives more time for the shuttle to show up and get back to Laguna Amarga. Our stay to Punta Arenas was not going to be complete without a trip to Torres del Paine National Park. While it is possible to take a day-tour from PA, we didn’t just want to spend most of the day on a bus and only a couple hours in the park. 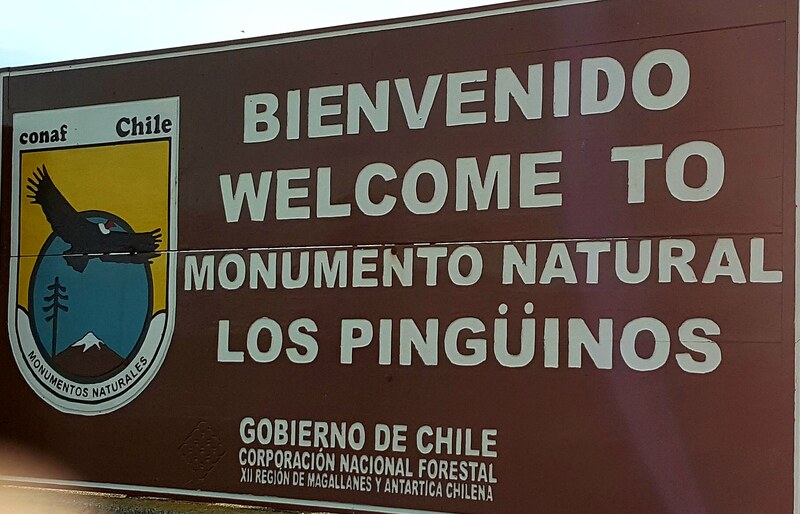 We opted instead to find a cheap Airbnb and head to Puerto Natales for a couple of days. Due to a hassle getting a computer shipped to and from the US for repairs, we had to delay seeing the park until the very end of our time in Patagonia. But somehow we lucked out – ending up with the apartment we had been eyeing after another guest canceled and great weather for our hikes. Puerto Natales is about three hours by bus from Punta Arenas – and the entire drive is scenic. We passed thousands of grazing sheep, guanacos, and rheas, and saw wild flamingos for the first time. After arriving, we took in the town’s waterfront, which provided tempting views of the mountains we’d be visiting. A short stop at Unimarc set us up with groceries and snacks for the hike. We tried and failed to get to bed early even though we knew we’d need to be up by 6 a.m. for the two-hour bus ride to Torres del Paine itself. At the Laguna Amarga entrance, everyone got off the bus to register, pay the entry fee, and watch a safety video (NO fires, stay on trail, pack out all garbage). We also needed to get our tickets stamped so we could use them to reenter the following day. From there we hopped into a van acting as a hotel and campground shuttle. The gravel roads in the park are in fairly good condition, but the vans and buses still take the corners frightfully fast, especially when you are stuffed in with everyone’s camping gear and the pile is threatening to tip over with every turn. After the short ride, we were left off in front of a cafeteria about a 10-minute walk from the Hotel Las Torres, where the Torres Mirador trail begins. Even walking up the last portion of the road, the view is stunning. It is hard to take a bad photograph; it is also hard to capture the vastness of the landscape. The trail begins innocently, taking hikers through some flat ground where giant hares keep the grass trimmed and where we saw a fox slinking around the bushes. After crossing the stream for the first time, the path starts gently upward. The first portion has a lot of small gravel and larger stones that are easier to walk up than side down. Many people had hiking poles, and that would have been a good idea, especially later in the day after our muscles started to burn. We also quickly realized that much of the path between the Hotel and the El Chileno refugio, about halfway up, is shared with horses. They are used to transport supplies and tired hikers up and down the trail, but also tend to use the path as a bathroom… Our limited packing space means I did the trail in cloth running shoes, so it was extra important for me to pay attention to where I stepped. Despite it being fall, the weather was warm and we found ourselves shedding layers fairly quickly. Fortunately, we climbed into some trees and had shade to protect us from the sun. In Patagonia, the sun is always strong, even in a cool wind. We were glad for sunscreen and bugspray, since the nice day brought out the last of the mosquitoes as well. The first few miles of trail gain elevation and then lose it as the trail approaches El Chileno. Views of the surrounding peaks only confirm that every step downward means one more upward later. As we dropped beside the river, the forest surrounded the path. Moss-covered trees reminded up of the Pacific Northwest and this stretch was one of our favorites parts of the hike. Going up through the trees, we eventually came out along the boulder field that makes up the last kilometer of the climb. The sign warns it takes about 45 minutes to make it to the top – we took 40 and moved at a fast pace to fit our bus schedule. Here, sections of the trail are essentially stream bed – we climbed over wet rocks slippery with dust and mud. This single kilometer packs in about a thousand feet of upward gain. It is possibly the steepest section of trail we’ve ever gone up. It was especially crowded with people, and in some spots there isn’t much room, so stopping and pausing while others passed by headed the other direction was common. And then, finally, after more than three and a half hours of hiking, the Torres themselves. They are spectacular, made more so by the turquoise-sunset blue waters at their base. Even with dozens of other groups eating lunches, it doesn’t feel crowded. The granite towers rise almost vertically out of the surrounding rocks – other nearby mountains are being worn down and might someday reveal other spires. The scenery leaves no doubt why this is one of the world’s best known hikes and one of Chile’s top destinations. Superlatives don’t cover it, and pictures don’t come close to doing it justice. Of course, only having nine hours from the time the bus dropped us off to when we expected to be picked up again meant that we only had about 15 minutes at the top. Our timing was fortuitous, however. After we’d been up there about 10 minutes, the wind started out of nowhere. I went from not needing a jacket to layering back up instantly. Clouds that had hung over distant peaks began to cover the sun. Standing up again after a quick granola bar, our legs were already tired and we still had almost 6 miles left to go. (No wonder you can order horses to take you back from El Chileno!). Having not done much mountain hiking in the last year and half, we were out of practice. Scrambling down the boulder field, I shamelessly used by hands to steady myself and lower myself over taller rocks (my legs are not really that long). Once we got into the woods, it was easier and the trail mostly clear of rocks and roots. Going down and back up out of the river basin was the final straw for my knees, though. The last downward portion of the trail that takes you from forest back to the more open scrubland was slow and painful. 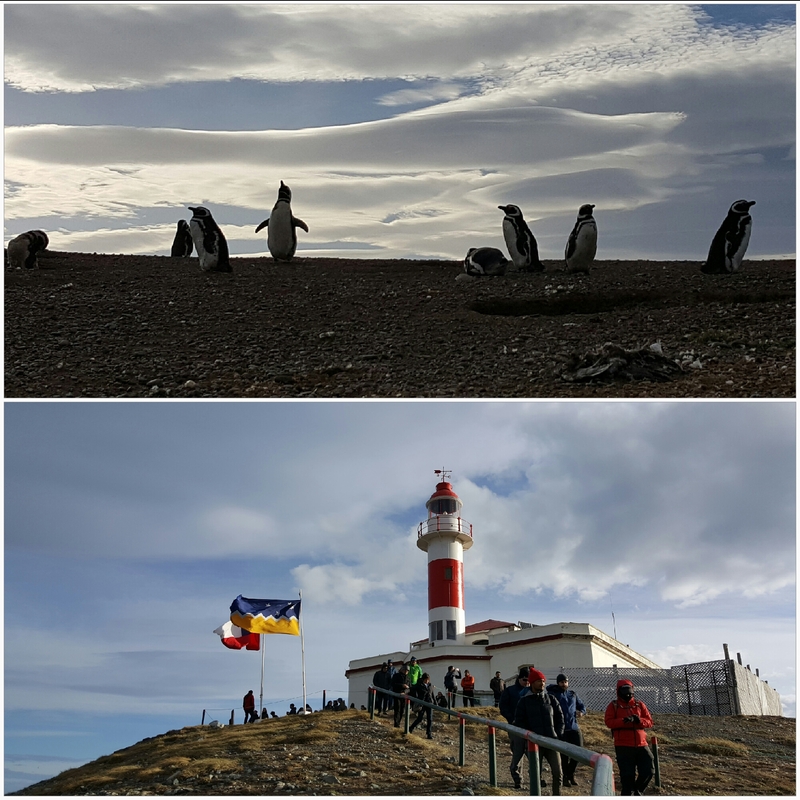 So what I looked a little penguiny for the last rocky kilometer or so, I finished the hike and reminded myself that others who were in better shape are some of the best hikers in the world. We were faster than our 8-hour limit and had time for a beer from the kiosk at the trailhead before walking the last (mercifully flat) stretch to meet the shuttle. The bus back to Laguna Amarga was supposed to arrive just after 6 p.m., giving us about an hour before the 7 p.m. bus back to Puerto Natales. That time came and went, as did 6:30 and 6:45. I started to get a bit panicky – as did several others who were waiting. The shuttle was called for a couple of times and finally arrived just before 7. Fortunately for us, most of the passengers were also supposed to be on our bus back to PN, so it was held for us at the Laguna Amarga entrance. It ended up leaving more than half an hour late. If we’d have known, we could have had a lot longer at the top or taken it easier coming down. Still, was thankful to have made the bus and not have to worry about getting seats on a later departure. Back in Puerto Natales, we had just a few minutes to spare before Unimarc closed for the evening. We came away with a meal of as many empanadas as we could eat. The short walk back to our house made us grateful for the wine that was waiting. I’ve never had my tendons and muscles seize up so fast after a hike. I hadn’t looked at the mileage or the elevation gain beforehand, and we now discovered we’d gone nearly 12 miles with 3,000 feet of elevation gain (and then loss). I’d guessed it was more like 8 or 10 miles and 2,000 feet. At least I’d earned all the aches. Of course, we’d be up early the next day to do another hike – but at least we’d planned for a shorter one to follow our first-day adventure.